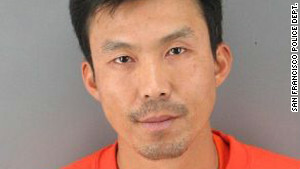 Binh Thai Luc, 35, was arrested in San Francisco on Sunday and charged with five counts of murder. (CNN) — A San Francisco man was arrested and charged with murder Sunday, two days after five people were found dead in a residence in that northern California city, police said. The victims were found around 7:45 a.m. Friday in a building near the City College of San Francisco in the city’s Ingleside district, said Commander Michael Biel, head of the San Francisco Police Department’s investigations division. There were “four separate homicide scenes within the residence” — suggesting people had been killed in four different locales — Police Chief Greg Suhr said. Suhr said the five died “apparently from blunt trauma, (though) we really didn’t know what happened.” He added later that there also was an “edge-weapon involved,” capable of cutting someone, but there was no evidence of gunshots. His brother, 32-year-old Brian Luc, was also arrested and charged with narcotics possession, a felon in possession of ammunition and for a probation violation, according to police. The two live together in the city. The police chief said there was “a relationship” between the suspect and the victims, though he did not specify what that was.